Needless to say, the legal research market has long been dominated by Westlaw and LexisNexis. Even as any number of other legal research platforms have come along, what has continued to distinguish the big two are their libraries of secondary legal materials. While it is relatively easy for a smaller legal research company to provide access to primary law such as cases and statutes, it is much more difficult and expensive to provide access to secondary content such as treatises, practice guides and expert commentary. In this sense, secondary content is the Holy Grail for any company aiming to compete in the big leagues. Yet over the past decade, a rich body of expert commentary has developed in the form of thousands upon thousands of blog posts from lawyers who are experts in their fields across all areas of law. Nowhere has this been more evident than in the LexBlog network, where a company that started out creating blogs for lawyers is now host to a network of more than 15,000 legal bloggers regularly producing posts about virtually every legal topic. 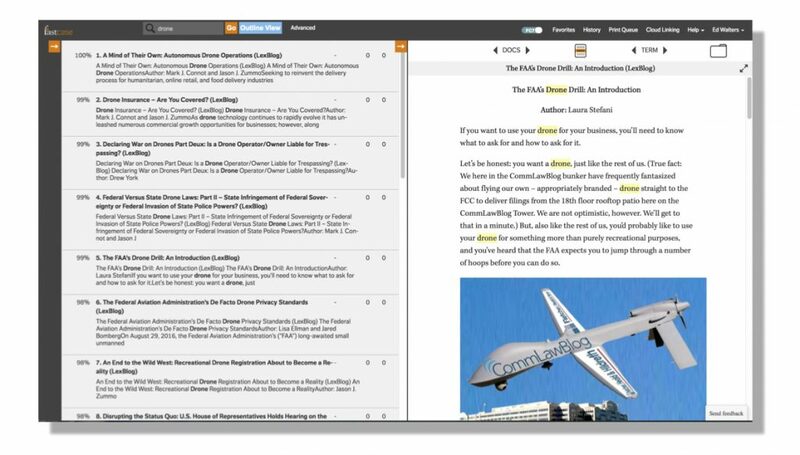 So it makes perfect sense that Fastcase and LexBlog are today announcing a new Fastcase library of expert legal commentary, fueled by curated posts from LexBlog’s network of legal bloggers. The new library will be available at no extra cost to all Fastcase subscribers. The LexBlog content is available only in Fastcase 7. I learned of this news last night and was able to try it briefly with a couple of quick searches. I found some useful and in-depth articles about some rather esoteric topics. It is nice to be able to search across a wide range of blogs and quickly find relevant posts.